After rolling out the Nougat update to its Mi 5 smartphone last week. 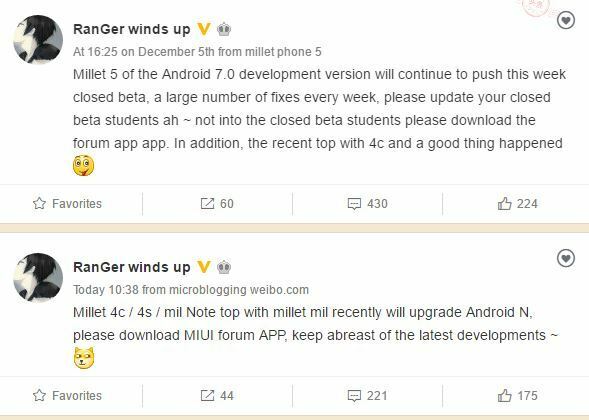 Xiaomi has now confirmed some more of its phones that'll get the update. The confirmation came in the form of a Weibo post from a company representative. The list includes the Mi 4c, Mi 4s, Mi Note, and Mi Max. There's currently no information on exactly when the update will be rolled out, although reports say that might happen sometime in the first quarter of 2017. Other Xiaomi devices that'll get the update include the Mi 5s, Mi Note 2, Mi Mix. If only they can fix the caller id bug on stable ROM first. this is the most basic function of a phone, and they failed at it.